Figure 7. 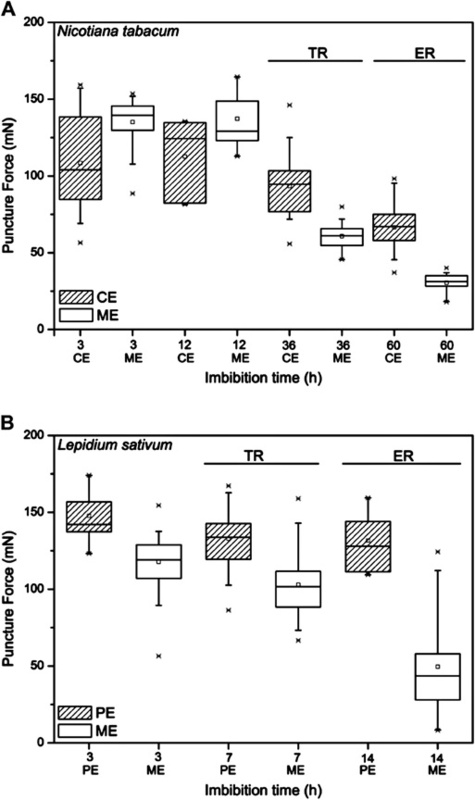 Puncture force analyses of tobacco and Lepidium endosperms during germination. A, Puncture force measurements of ME and CE from tobacco. B, Puncture force measurements of ME and PE from Lepidium. Tobacco seeds exhibit testa rupture (TR) at 36 h, and endosperm rupture (ER) begins at 60 h. Lepidium seeds exhibit testa rupture at 7 h, and endosperm rupture begins at 14 h. Pre-endosperm rupture tobacco and Lepidium seeds were selected for the 60- and 14-h measurements, respectively.